First, let's look at the rules that apply if you are inheriting a 401(k) plan from your spouse. If your spouse was over age 70 ½ and thus had already started taking required minimum distributions at the time of death, and you are over age 70 ½, the rule is that you must, at a minimum, continue to take out at least the required minimum distributions. This could happen in a few ways. You can leave the money in the plan, continuing the distributions according to the required minimum distribution schedule that applied to your spouse. If you desire you can take out more than this amount, but not less. The beneficiary designations set up by your spouse continue to apply. You can roll the funds over to a specific type of account titled as an "Inherited IRA." With an Inherited IRA, you would take required distributions based on your single life expectancy table. If you desire you can take out more than this amount, but not less. You would name your own beneficiaries with this option. You can roll the funds over to your own IRA, called a spousal IRA. With this option, you would take required distributions based on your age and the Uniform Lifetime Table. If you desire you can take out more than this amount, but not less. You would name your own beneficiaries with this option. For most people, this is the best option. If you and your spouse were about the same age, the choices above will result in about the same required distribution. However, rolling it over to your own IRA may provide additional choices for your future beneficiaries. You can check out a required minimum distribution calculator to calculate the amount you would be required to take. It is based on your age and the applicable table. You can leave the funds in the plan. If your spouse was over age 70 ½ and had started their distributions you continue taking these required minimum distributions each year, or you begin taking them at the time your spouse would have reached age 70 ½. The beneficiary designations set up by your spouse continue to apply with this choice. You can roll the funds over to a specific type of account titled as an Inherited IRA. As an Inherited IRA, you take required distributions based on your single life expectancy table. If you desire you can take out more than this amount, but not less. You name your own beneficiaries with this option. You can roll over the account into your own IRA. The potential advantage to this is you will not be required to start distributions until the calendar year after you reach 70 ½. This option provides additional flexibility because you can withdraw the money if needed, but you won't be required to withdraw it until you reach age 70 ½. You name your own beneficiaries with this option. For most people, this is the best option. If your spouse was older than you, you need to project your current and future income tax rate to determine if it is best for you to delay distributions until your age 70 ½, or continuing with the annual required distributions if your spouse had already been required to start taking them. Additional IRA distributions may make more of your Social Security income taxable. It thus may be to your benefit to take more IRA distributions before your Social Security benefits start. A skilled retirement planner can help you determine your best course of action. 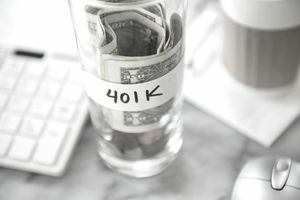 If you inherit a spouse’s 401(k) plan but you are not yet age 59 ½, consider the pros and cons of the following choices. You can leave the money in the 401(k) plan. With this option, you can take withdrawals as needed and the 10% penalty tax will not apply even if you have not yet reached age 59 ½. You will still pay regular income tax on any amount withdrawn. (With this choice if your spouse was over age 70 ½, you will be required to continue the required minimum distributions.) The beneficiary designations set up by your spouse would continue to apply at your death. You can roll the funds over to a specific type of account titled as an Inherited IRA. With an Inherited IRA you take required distributions based on your single life expectancy table. You can take out more than this amount, but not less. With this option, withdrawals are not subject to the 10% penalty tax even if you are not yet age 59 ½. You name your own beneficiaries with this option. You can roll over the 401(k) plan to your own IRA account. There will be no taxes on this transaction. However, if you are not yet age 59 ½, you may not want to do this, because once it becomes your own IRA, any distributions you take will be considered early distributions and subject to a 10% penalty tax as well as regular income taxes. You name your own beneficiaries with this option. For most people who are not yet age 59 ½, the best option will be option 1 or 2 above.